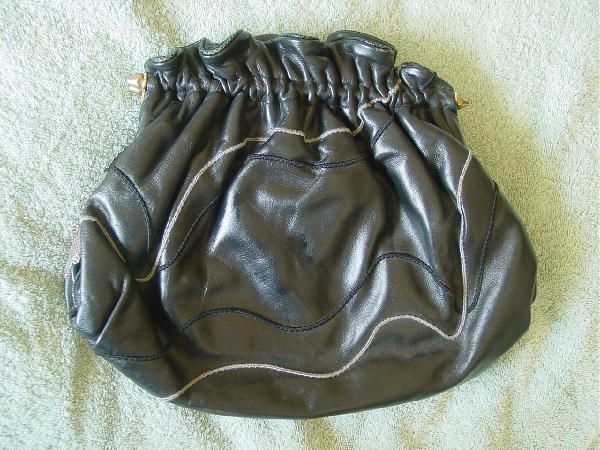 This vintage black purse is by Carlo Fiori of Italy and has a 1 1/8" high ruffle above the gold-tone purse rim, which has an egg-shaped bypass closure. The front has snakeskin patches in light taupe, deep wine, burnt red clay, black, gray, and cocoa. There are lizard patches in light and dark brown. It has 2 decorative tassels in the front, an elevated gold-tone encircled f, and 6 tiny gold-tone balls. There are two 19" long by 1/4" wide shoulder straps that are tied together, giving you a 37" long shoulder strap. 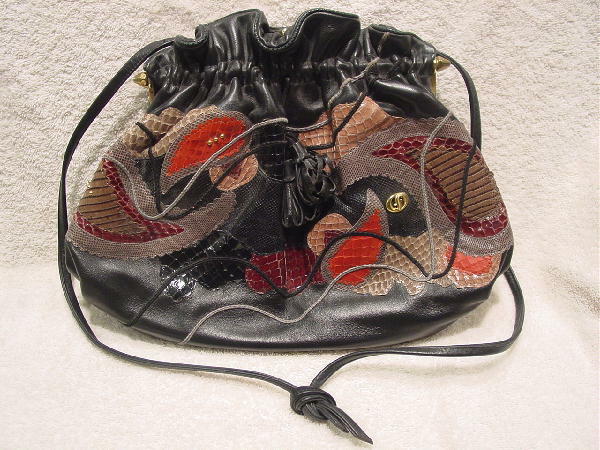 The very nice interior is in a thick black brushed cotton with a gold-tone cord trim on the large interior pocket. There is a gray and black cord freeform line design on the front and back. The burnt red clay color is actually shown on the right side of the front picture. The light reflected on the 2 larger patches and it caused their color to change. There are 2 light scuff marks on the back center.